As strange as it might seem Triglave National Park is the one and only national park in Slovenia. 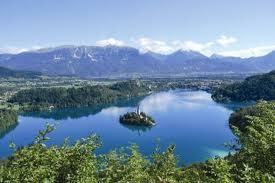 It is located in a lovely area of the Julian Alps in the northwestern part of Slovenia. It was named after the country’s highest mountain Triglav. Triglav means “three headed” due to its characteristic shape. The highest Slav deity supposedly had his throne on the mountain top and this mountain is a national symbol being featured on the nation’s coat of arms and flag. Here visitors can see amazing mountain peaks and beautiful valleys. This national park is bordered by Italy and Austria and is practically covered by all of the Eastern Julian Alps. The park was incorporated into the international network of UNESCO biosphere areas in 2003. Triglav Nationa Park includes the Triglav lakes and four mighty mountain peaks – Mangart, Jalovec, Prisojnik and Spik. There are lush forests which are covered mostly by beech trees as well as north spruce and larch. 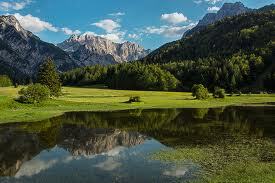 The valleys supply water to two large river systems that have their sources in the Julian Alps. The Soca and the Sava flow toward the Adriatic and the Black Sea. Hikers can find marked and secured trails which go through the mountains and lead up to the peaks for fantastic views. Visitors can find plenty of mountain lodges and huts in which to relax and spend the night. The park’s highlight is Slovenia’s largest glacial lake – Lake Bohinj. Here you can participate in water sports in the summer and in the winter it freezes. Other lakes in the park include Krnsko jezero and there are also a number of waterfalls, the two most impressive are Savica and Pericnik. A popular tourist destination is the amazing Radovna River gorge of Blejski Vintgar. The Soca River area offers a place for high-adrenaline sports like rafting and hydro speeding. In the forests you can find smaller animals like squirrels and larger animals like the brown bear, wolf, lynx, and wildcat. There are also chamois and roe deer. You have to be careful of the black adder a poisonous snake. There are also different kinds of insects and lizards. Among birds you can see the capercaillie or wood grouse, the golden eagle and the black grouse. Among the world of flora there are many different kinds of herbs, plants and bushes. Among them the vanilla orchid and the hairy alpenrose and a species native to the Alps the lovely Zois’ bellflower.